This article is about the high school basketball coach. For his son, the retired basketball player, see Bobby Hurley. 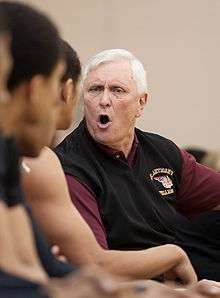 Robert Matthew "Bob" Hurley, Sr. (born July 31, 1947) is the basketball coach at St. Anthony High School in Jersey City, New Jersey. Hurley has amassed 28 state championships  and more than 1000 wins in 39 years as a coach. On February 2, 2011, Hurley became the tenth coach in high school history to win 1000 games. He is featured in the documentary: "The Street Stops Here." Five of his teams have gone undefeated. On April 5, 2010, he was announced as the only coach to be inducted into the Basketball Hall of Fame that year and only the third high school coach in history to be so honored; he was formally inducted on August 13 of that year. Hurley is the father of Bobby Hurley, a former All-American point guard at Duke and the head basketball coach at Arizona State, and Dan Hurley, who was hired in February 2012 to coach the University of Rhode Island after two years of coaching at Wagner College and nine years coaching at Newark's Saint Benedict's Preparatory School, also one of the top high school programs in the nation. Bob was born in the Greenville section of Jersey City and raised in St. Paul the Apostle parish, in an era when neighborhoods identified with their parishes. His father was a police officer. Hurley attended St. Peter's College, but walked off the varsity basketball team in his sophomore year after not being in the team's plans. He began volunteering as a coach for a Catholic Youth Organization grammar school team in his parish. He became a probation officer and held that position for 35 years, while also coaching. He retired in 2008. Hurley began coaching at St. Anthony in 1972. St. Anthony, run by Felician Sisters, has one of New Jersey's smallest student bodies, most of who live below or near the poverty line. Hurley has never been a teacher at or a full-time employee of St. Anthony. For most of his career, the coach remained employed as a probation officer. Thereafter, he worked for the Jersey City Recreation Department, but has since retired. He has been instrumental in the restoration of the historic Jersey City Armory to a modern sports arena. Hurley has produced over 150 players to Division I basketball programs, all on full scholarships. Hurley has coached five first round NBA draft picks, including his own son, Bobby Hurley. Hurley's undefeated 1989 team, which featured Jerry Walker, Hurley's son Bobby, Terry Dehere, and Rodrick Rhodes, was ranked first in the nation by USA Today. Three of the players on that team — Bobby Hurley, Dehere and Rhodes — were first round draft choices in the NBA draft. That team won New Jersey's first Tournament of Champions and amassed 50 straight victories in a two-year span. It is generally considered one of the best teams in New Jersey history. Hurley's 2003–04 team, also undefeated and ranked second in the nation, is the subject of The Miracle of St. Anthony, a best-selling book by Adrian Wojnarowski. The book chronicles how the team marched to an unbeaten season, state title, and number 2 national ranking despite off-the-court crises and not having a single senior graduate to a Division I program. Hurley's 2007–08 squad was also undefeated, finishing with 32 wins and no losses and ranked number one in the U.S. even though no starter is taller than 6'6". The team had six seniors who had never won a championship at the high school, something that has never happened to one of Hurley's teams. They also won Hurley's 10th Tournament of Champions, winning its state tournament games by an average of more than 27 points per game. All six of the seniors would eventually receive Division I basketball scholarships, including Mike Rosario (Florida), Tyshawn Taylor (Kansas), Travon Woodall (Pittsburgh), Jio Fontan (Southern California) and Dominic Cheek (Villanova). "The Street Stops Here," a 2010 documentary narrated by Harry Lennix, reviewed Hurley's impact on St.Anthony's basketball and captured several compelling moments that season. It premiered nationally on PBS March 31, 2010 and was released on DVD. St. Anthony has won 27 state championships, more than any other school in U.S. history. Hurley was the coach for 25 of those teams and an assistant coach on the other two. His teams are known for their speed, defensive intensity, and precise ball movement. Every senior to graduate from his program has won at least one state championship, with many winning several. Hurley has also produced a total of five first round NBA draft picks: his son, Bobby, Dehere, Rhodes, David Rivers and Roshown McLeod. Over the years, Hurley has been offered a number of college coaching jobs, but has declined them all. He is also one of just a few high school coaches to be enshrined in the Naismith Memorial Basketball Hall of Fame. Hurley gained national attention when his son Bobby graduated and became a four-year starter and All-American at Duke University. Bobby, along with Grant Hill and Christian Laettner, led Duke to two NCAA titles. Bobby is currently the head coach of the Arizona State University men's basketball team. He has previously been an assistant coach for Wagner and an associate head coach for Rhode Island on the staffs of his younger brother Dan. For a number of years, Hurley's teams were challenged for supremacy in the state by Saint Benedict's Preparatory School of Newark, which was coached until 2010 by Bob's younger son, Dan Hurley, who played for him at St. Anthony before going to Seton Hall University. Indeed, in 2008, when Bob's team was ranked #1 in the nation, Dan's St. Benedict's squad was ranked #2, and only a 3-point loss kept St. Benedict's from an undefeated season and a #1 ranking of its own. Dan Hurley is currently the head basketball coach at the University of Rhode Island after a two-year stint at Wagner College. ↑ "Robert "Bob" Hurley, Sr.". Naismith Memorial Basketball Hall of Fame. Retrieved August 14, 2010. ↑ "New Jersey State Interscholastic Athletic Association State Championship history" (PDF). New Jersey State Interscholastic Athletic Association. Retrieved August 29, 2013. ↑ The Hurleys Build a Dynasty by Grant Glickson, The New York Times, February 1, 2004. Accessed February 12, 2008. ↑ "Naismith Memorial Basketball Hall of Fame Announces Class of 2010" (Press release). Naismith Memorial Basketball Hall of Fame. 2010-04-05. Retrieved 2010-04-05. ↑ Lieber, Jill (October 7, 2002). "On defense at St. Anthony's". USA Today. ↑ Hague, Jim (January 15, 2006). "Historic sports palace restored Jersey City Armory enjoys grand re-opening after 4-million facelift". Hudson Reporter. Retrieved 2011-01-05. ↑ "St. Anthony Takes Title to End at 32–0". New York Times, march 20, 1989. March 20, 1989. Retrieved April 26, 2010. ↑ "A Basketball Miracle by Dan Ackman". Forbes.com, April 1, 2005. April 1, 2005. ↑ "A Step Closer to Perfection by Kevin Armstrong". Sports Illustrated, March 6, 2008. March 6, 2008. Retrieved April 26, 2010. ↑ "St. Anthony Captures T of C Crown". The Star Ledger, March 18, 2008. ↑ "For St. Anthony, a State Title Would Be the Perfect Ending by Zachary Braziller". The New York Times, February 27, 2008. February 27, 2008. Retrieved April 26, 2010. ↑ "A Coach Who Likes Just Being in the Present by Dave Anderson". The New York Times, February 22, 2007. February 22, 2007. ↑ "The King and Prince of High School Sports by Dan Ackman". The Wall Street Journal, January 24, 2007. ↑ "Family first: Danny Hurley has built St. Benedict's into a power by Kevin Armstrong". Sports Illustrated, December 16, 2006. December 15, 2006. Retrieved April 26, 2010.